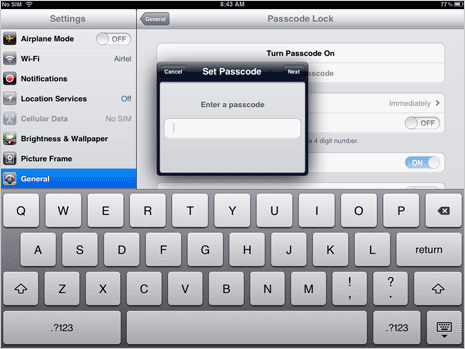 By default, iPad has simple passcode feature allowing you to select only 4 digits password. You can use this feature and lock ipad with login password to restrict usage. Using simple passcode has serious limitation of password being too simple. The default simple password feature only allows you to select 4 digits as passcode for iPad login. Unfortunately, guessing a 4 digits passcode and breaking into iPad is not a tough task for few individuals. Hence, to add more security you can switch to using more complex (and secure) passcode for your iPad. 1. Tap on Settings icon on the homescreen and then tap on General option. Now tap Passcode Lock option to view ‘Passcode Lock’ settings page. 2. Slide to set OFF status for ‘Simple Passcode’ option. Once you deactivate this option, iPad will allow you to choose more complex password with mix of alphabets, numbers and special characters. 3. Now tap on ‘Turn Passcode On’ opton to view window to enter your new complex passcode. Now you should see full on-screen keyboard instead of just number dial as seen in case of simple password. Now you can easily create complex password consisting of special characters, alphabets, words, numbers and so on. 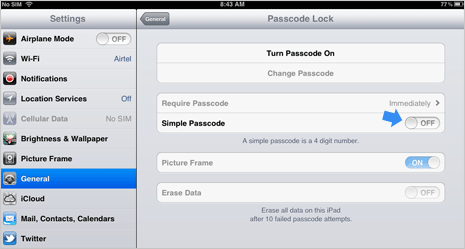 With complex passcode for iPad login, cracking it will be more difficult and hence adds more security to your iPad. Also, now it will more difficult for kids at home to guess out password and play games on iPad when parents are not around. For once, there is any easy way to out smart kids and prevent usage of iPad (when kids are suppose to do other things like study). If you do not like complex passwords or have tendency to forget them, you may stick to the default simple password option.